When you have a clogged drain, you want a company that you can trust to handle the job quickly and efficiently. The clogged drains can be very problematic in both the office building and home. In such a condition, you need an urgent service provider that can clear the pipes and fix the problem, and that’s what we are here for. 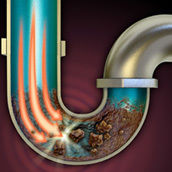 We offer services to clear clogged drains as well. The best part is, we are available 24/7/. Thus, you can contact us anytime you need.